When I do workshops for soccer coaches I routinely show them videos of amazing classroom teachers at work and we talk about how to adapt and apply the ideas they use in a coach’s setting. One of the videos I show coaches most frequently is of Denarius Frazier, one of the best math teachers I know. It’s exceptional for a lot of reasons but one thing that always jumps out is how he tracks his data–how (in this clip) he uses a clipboard to track the level of mastery his students show at a task and then responds by re-teaching the thing his observation has told him they struggle with most. Observing the gap between “I taught it” and “They learned it,” Denarius shows us, is too critical to leave to happenstance. This is a idea that coaches find compelling too. Training is a complex thing: 18 athletes trying to do a series of complex or challenging things you’ve asked them to do. So often they struggle to execute correctly but we fail to see the struggle (and re-teach) because its so challenging to see all the data in front of us unless we track it methodically. 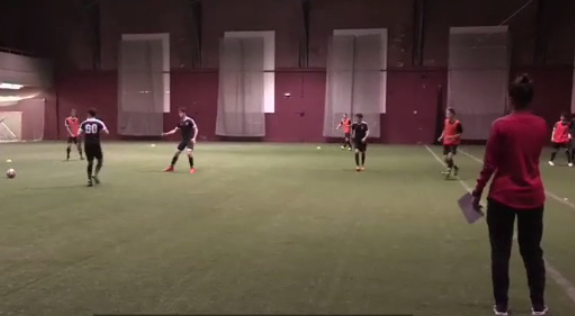 Anyway, at a recent session I taped–part of a project with US Soccer taping top coaches and learning from them–NY Red Bulls coach Kika Toulouse applied and adapted a similar idea in working with Black Watch Premier’s U19s. Like Denarius she’s tracking the data. And after 10 minutes of play she presents the data back to the boys and asks them to make sense of it- to problem-solve based on it. Kika Toulouse3.TNW from TLAC Blog on Vimeo. One of the coolest things about it is how Kika is able to use the data to help the boys see the difference between the opportunities they create and the opportunities they finish. Not only is she more aware of how they did but she uses the data to make the players more aware of the root causes of their struggle or success. Data, it turns out, is a powerful thing for coach and player.